Ryan Crouch is an S9 swimmer with Cerebral Palsy, and at the age of 22 years-old, he made it to the 2016 Paralympic Games in Rio. Ryan has been swimming since he was five years old, and started racing for Dovercourt Swimming Club in Essex when he was 11 years old. Inspired by a meeting with Olympic swimmer James Hickman, Ryan continued to progress, joining Colchester Pheonix to race nationally. Aged 11, Ryan was talent spotted by British Swimming and eventually moved his training to Team Ipswich under coach Dave Champion. His international debut soon followed, at the 2008 Danish Open. While missing qualification for London 2012, Ryan remained committed to the sport despite a number of health issues. The hard work and persistence paid off when Ryan, who is self-coached, hit the qualification times for Rio 2016 in the 50m freestyle S9 at the British Para-Swimming International Meet in April 2016, securing a place at his first Paralympic Games. Ryan is also a 4 x British Record Holder and hopeful of qualifying for the World Championships in Mexico later this year. 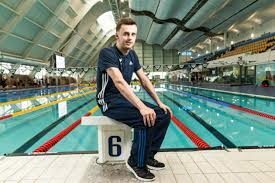 He applied for a DRF scholarship in 2017 in his quest to qualify for the Para Swimming World Championships in Mexico later that year, and also the British Summer Championships in the 50m and 100m Freestyle events. We were delighted to play a small part in his journey.